The Daily Telegraph’s health correspondent Martin Beckford has reported an order has been made in the Court of Protection banning approaches to witnesses in a case involving an individual referred to only as ‘M’ and addresses linked to the main parties. It goes on to say that the order – which will remain in effect “during the lifetime of M” – bans anyone who is sent it from “communicating with M or with any other member of M’s family, whether orally in person, or by telephoning, text message, email or other means”. According to the Telegraph the injunction lists 65 different people who must not be contacted, except through a solicitor. The order also allegedly bans reporters from going within 50 metres of four properties listed. This entry was posted in Editors' pick, Legal and tagged Court, Court of Protection, Daily Telegraph, Legal on April 20, 2011 by Rachel Bartlett. Business secretary Vince Cable had thought about resigning following the exposés by the Daily Telegraph on comments he made while being secretly recorded by undercover journalists, the BBC reported today. Cable was stripped of the responsibility for making a decision over News Corp’s bid for BSkyB following the comments he made, which included him saying he had “declared war on Mr Murdoch”. Cable was being recorded by the reporters, who posed as Lib Dem voters in his constituency. The Press Complaints Commission said in January it would be investigating the “use of subterfuge”. Asked by BBC World At One, broadcast today, reporter Becky Milligan if he had thought at the time that he should resign Cable said he had “certainly thought about it”. The people who I’m closest to and have the most respect for, including my own family of course, thought that wasn’t the right thing to do. … That six weeks or so was quite dreadful. You’re under a lot of pressure, political and emotional, you discover you’re friends. Later asked if David Cameron and Nick Clegg were supportive he said they wanted to keep him in the government, but “were not happy about what had happened”. This entry was posted in Editors' pick, Politics and tagged BskyB bid, Daily Telegraph, Rupert Murdoch, Vince Cable on April 18, 2011 by Rachel Bartlett. Author Frederick Forsyth discusses how his passion to travel led him to an early career as a journalist, in an interview with the Daily Telegraph this weekend. His time spent reporting for news organisations including Reuters and the BBC was not only valuable in developing the investigative research skills which would later help him write “meticulously researched” novels, but also for revealing where his true passions lay. This entry was posted in Editors' pick, Investigative journalism, Politics and tagged BBC, Daily Telegraph, Frederick Forsyth, Politics, reuters on August 16, 2010 by Rachel Bartlett. Newspaper tycoon Conrad Black has been released from prison in Florida on bail. According to a report today by the BBC, the former Daily Telegraph owner Black was released on a $2 million bond, pending an appeal over fraud convictions. He was convicted of defrauding shareholders in 2007 after pocketing tax-free bonuses without permission, as well as obstructing justice and sentenced to 78 months in jail. But a ruling by the Supreme Court in June weakening the “honest services” law central to his conviction made bail likely. Black’s release was preceded by a Supreme Court ruling on one of the laws used to convict him. It said the three counts of fraud were based on a vague piece of US law that was interpreted too broadly by the prosecution. Black has always claimed his innocence and launched several unsuccessful appeals, according to a report by the Telegraph on his release. This entry was posted in Legal, Newspapers and tagged Conrad Black, Daily Telegraph, journalists in prison, Supreme Court on July 22, 2010 by Rachel Bartlett. Where? She has her own blog, The Scribbler, where she posts up “new case study requests for features I’m working on and thoughts on current issues”. Her articles for various different publications are collected on her Journalisted page. Ewing works mostly for Mail Online and the Daily Telegraph, covering health, celebrity, relationships among other things. She has also contributed to the Times, and frequently run into trouble with her luggage while travelling. This entry was posted in Recommended journalists and tagged #followjourn, Daily Telegraph, Freelance, Mail Online, Sarah Ewing on April 6, 2010 by Joel Gunter. I’m sure we ordinarily consider ourselves above such things, but, as it is Friday afternoon on the Journalism.co.uk blog, here is a pretty regrettable subbing error from the Telegraph to brighten up your (rainy, if in the south of England) day. 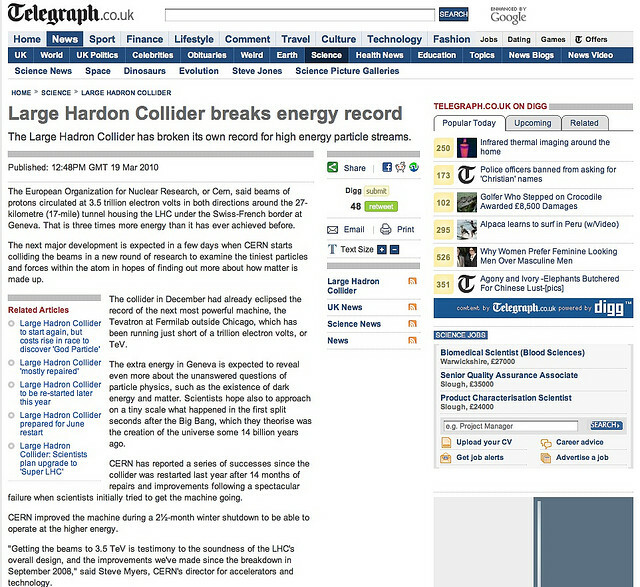 This entry was posted in Journalism and tagged Daily Telegraph, large hadron collider on March 19, 2010 by Joel Gunter. On Press Gazette, PA Mediapoint reports that ‘lawyers for the tennis player suing the Daily Telegraph after it described him as being ‘ranked as the worst professional tennis player in the world’ have estimated that legal costs for the case could run to £500,000′. Full story at this link…. This entry was posted in Editors' pick, Journalism, Legal and tagged Daily Telegraph, libel, media law, tennis on October 21, 2009 by Judith Townend. The Audit Bureau of Circulations (ABC) has today brought out its revised figures for national newspaper circulation in the UK, reducing the headline circulations of titles including the Daily Mail, Daily Telegraph and Financial Times in the light of an investigation into ‘bulk copies’ distributed by Dawson Media Direct, for the London Evening Standard, Mail on Sunday and Sunday Telegraph. The UK newspaper circulation body revised the figures because audit trails for ‘bulks’ did not comply with ABC rules. Earlier this year, the Financial Times reduced its use of bulks, and this week Guardian News and Media announced that it was currently ditching its bulk distribution completely. The Sunday Times was the only ‘quality’ Sunday title to post a year-on-year rise in sales (2.74 per cent). On average the ‘quality’ Sunday titles posted a 2.77 per cent year-on-year fall. The Independent on Sunday posted the biggest year-on-year drop – 19.98 per cent. All the daily titles audited posted a year-on-year drop in sales, apart from The Star which increased its circulation by 20.12 per cent compared with July 2008. The Sun recorded a tiny drop of 0.4 per cent year-on-year and although the Daily Mirror was down 7.16 per cent compared with last year’s figures, month-on-month the title’s sales rose by 0.73 per cent. A more in-depth analysis of these results is available on Guardian.co.uk. This entry was posted in Newspapers and tagged ABC, Bulks, Circulation, Daily Mail, Daily Telegraph, Financial Times, gnm, Guardian.co.uk, Sunday Telegraph, Sunday Times, The Daily Mail, The Daily Mirror, The Financial Times, the Star, the Sunday Times, United Kingdom on August 14, 2009 by Helen Martin.